Surge Protectors safeguard LED lighting. Rated for use in harsh environments, including outdoor mounting, serial Model LS10 and parallel Model LS12 protect LED lighting from transients and surges generated by lightning and switching transients. Units feature Metal Oxide Varistor technology as well as high energy discharge tube technology with failure disconnect network. Offering fully automatic operation, devices provide protection for 120-347 V and 480 V systems. Cooper Industries plc (NYSE: CBE) is a global electrical products manufacturer with 2011 revenues of $5.4 billion. Founded in 1833 Cooper's sustained success is attributable to a constant focus on innovation and evolving business practices, while maintaining the highest ethical standards and meeting customer needs. The Company has seven operating divisions with leading market positions and world-class products and brands, including Bussmann electrical and electronic fuses; Crouse-Hinds and CEAG explosion-proof electrical equipment; Halo and Metalux lighting fixtures; and Kyle and McGraw-Edison power systems products. With this broad range of products, Cooper is uniquely positioned for several long-term growth trends including the global infrastructure build-out, the need to improve the reliability and productivity of the electric grid, the demand for higher energy-efficient products and the need for improved electrical safety. In 2011 fifty-nine percent of total sales were to customers in the industrial and utility end-markets and forty percent of total sales were to customers outside the United States. Cooper has manufacturing facilities in 24 countries as of 2011. For more information, visit the website at www.cooperindustries.com. Quarter Wave Stub Lightning Protectors cover 2.2-7.6 GHz range. Charge Dissipation Terminals provide lightning protection. 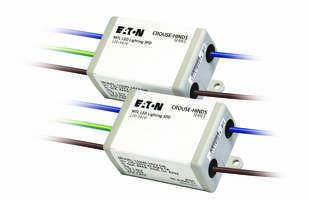 Lightning and Surge Protector targets Ethernet applications.